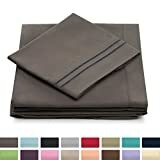 Sheet set contains elegant cotton King size one flat sheet, one fitted sheet and two king pillowcases. This product is suitable for daily use and all occasions. Sheet set contains luxury cotton Twin size one flat sheet, one fitted sheet and one standard pillowcase. This product is suitable for daily use and all occasions.